Mr Donald Wyatt has stayed in the same four-room apartment in Tiong Bahru since he was seven. He is now 80. Born in colonial Malaya, Mr Wyatt and his family came to Singapore in 1942. His mother was a nurse while his father was a teacher. Two months after arriving in Singapore, they moved into a Singapore Improvement Trust (SIT) flat along Tiong Poh Road, where he has lived ever since. 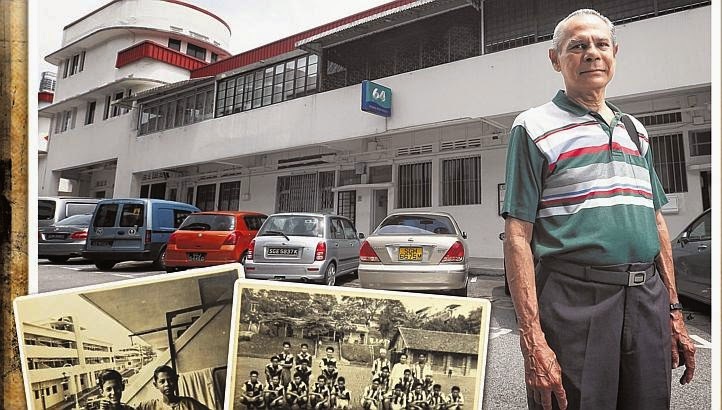 "During the Japanese Occupation, life was very quiet in Tiong Bahru," said Mr Wyatt. "Many people did not venture out into the streets." In the 1950s, while Tiong Bahru was properly maintained by the municipality, slums ringed the estate. "They were terrible," said Mr Wyatt, who worked for the International Federation of Freight Forwarders Association as the manager of its regional secretariat for Asia, before retiring in 1999. "The slums were the breeding ground for many diseases, including tuberculosis and malaria. They were overcrowded and appalling." Tiong Bahru was one of the first places where the colonial government built SIT flats in the 1930s. At first, the Wyatts rented their flat for $20 a month. Mr Wyatt bought it in 1967 for $19,000. This week in 1965, the authorities were encouraging tenants of the SIT flats to buy them, using easy payment terms. Mr Wyatt lives there now with his wife and youngest son, 29. He has four children, six grandchildren and two great-grandchildren. He recalls visiting the Tiong Bahru Market in the 1940s with his aunt and grandmother, when it was just a crowded collection of makeshift stalls. "The food sold there was provided by locals who planted their own vegetables and reared pigs," he said. Today the SIT flats of Tiong Bahru give the leafy estate its distinct look, the market is an established landmark for local fare, and hipster cafes, restaurants and boutiques have arrived in recent years bringing crowds of visitors. "I can live with it," said Mr Wyatt, who prefers the new Tiong Bahru to the one of his childhood. The old Tiong Bahru was more disorganised." Asked if he has ever thought of moving, he responded with a laugh: "Not really. There are too many memories here."